My heart is heavy. My beloved Grandpa Riedel suddenly passed away yesterday. Some of you might remember I just lost my Grandma, his wife, just a few months ago. I like to think they just couldn't be apart - he went to join her in heaven. I can just see them, in their restored, non-hurting bodies dancing their infamous German polka. I love this picture of him and my daughter from a couple of years ago. What a discussion they were having! As usual, he was passing along his wisdom and love. So bear with me while I travel to be with my family, reminiscing about all the great things this man did in his life and healing our aching hearts. I feel really bad about not posting lately, but sometimes life just gets in the way. While my parents were visiting, I really tried to stay away from the computer and enjoy our time together. And now there is this. I'm sorry and I'll be back soon. I am having such a fun week! My parents are visiting us from California. We don't see each other very often, so when we do, we really try to live it up. We are doing a lot of shopping, playing golf, heading to NYC for a Broadway show and (the best part of all) my mom and I are headed to the National Stationery Show on Monday. Yay!!! I love going to the show, but this year will be extra special because I'm going with my best friend. We jokingly call her my "west coast correspondent", but she really does do a lot for my business and blog. I value her design eye and she's constantly helping me through the process on a lot of my projects. 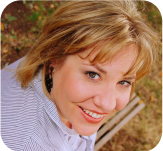 Another thing that really has me excited about this year's show is one of the guest speakers - Darcy Miller! Yeah, you know the editorial director of Martha Stewart Weddings. Cool, huh!? I'm looking forward to hearing her perspective on the current/future trends. So after my family leaves, I have so much to share with you - my Bloggy Boot Camp conference details and all the eye candy from NSS. I hope you were all pampered and appreciated today. I felt very loved - handmade cards, flowers and lots of yummy food! Seeing as we were out of town, all three meals were eaten out today. Um, yes, I loved not having to wash any dishes, but now I will be wearing elastic pants all week! On Friday night we stayed at the hotel where the conference was taking place, but Saturday night we had to switch hotels because the first one was already booked. No problem - besides, I kind of like seeing different hotels. So, we checked in to the new one, made our way to our room and had just started enjoying the view when there was a knock at the door. It was flowers!!! My sweet hubby called the hotel to get a florist recommendation while I was at the conference. Aren't they pretty!? I've never gotten flowers delivered to me at a hotel. I felt so special. I felt so loved. The florist was Winston Flowers. They are amazing! My photo does not do this arrangement justice. 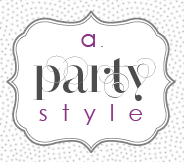 If you have any floral needs in the Boston area, I would highly recommend you call them. Jeromy said they were very helpful and really listened to what he told them I liked. Case in point, he mentioned one of my favorite flowers are calla lilies, but due to us traveling he just wanted a little arrangement. So, they fixed him up with a mini calla lily arrangement. Another detail I loved was they use beautiful, classic and very unique containers. I've never seen one like I received before. Even the message card sticks were cool! I'm weird, I know, but the little details get me all aflutter. Also, while strolling down Newbury Street on our way to play in Boston Commons today, we just happened to walk by a Winston Flowers shop. I was even more impressed!!! More unique containers and more beautiful arrangements. Anyway, this is a wordy post (sorry!) to tell you about a wonderful floral resource in the Boston area. I will definitely be using them again. Matter of fact, I'm going to write them a little note telling them how happy we were with their service. I know I loving hearing from my customers. Great job, Winston Flowers! "Now, why didn't I think of that!?" So, here in starts a new series. As I find some of this "stuff", I'll pass it along. Most will be party related, but some won't be; some gems that are just too good not to share. 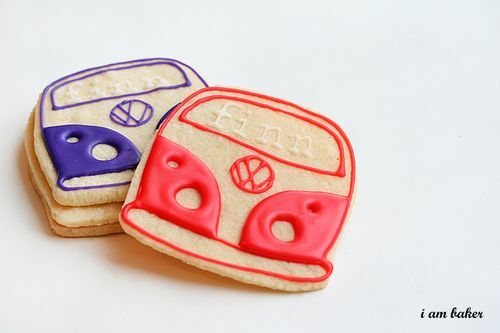 First up are these adorable VW bus cookies from the always inspiring i am baker. Aren't they cute!? 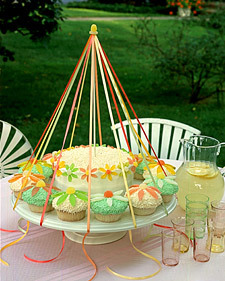 I sure wish I would have thought of these for my daughter's peace/second birthday party. 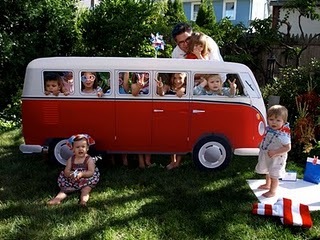 They would have matched the VW bus photo booth we made perfectly. These cookies would have been great on the dessert table!? Why didn't I think of that? 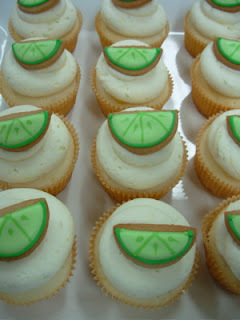 Margaritas (my favorite drink, by the way) are obviously synonymous with Cinco de Mayo. 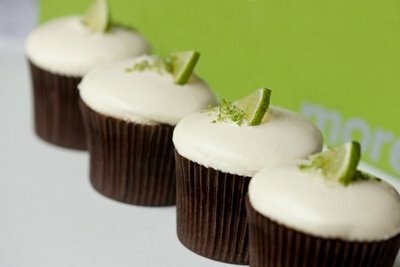 So what do you get when you mix my favorite drink with my favorite food group (frosting, ahem!)? Margarita cupcakes, of course! I have always wanted to try and make some, but just haven't gotten around to it. (What's the hold up, Anne!?) Anyway, check out this round-up of pretty 'rita's! Now, I'm off to make a batch of margaritas - It's five o'clock somewhere, right! I had a cake order this weekend for a little guy who loves construction - especially construction cones! His mom provided me with his favorite construction toy trucks and I included them in the design. I "excavated" out some of the cake and made a mound with it along with a little flag. I added a fondant road, some candy rocks and there you have it - an edible construction site! A little sidebar I have to share... I still get nervous every time I deliver a cake. While driving, all I can think about is "I hope they like it, I hope they like it, etc." I always hope I have exceeded the clients expectations. Well, this delivery was awesome. Not only did they like it, but the mom even started crying! So sweet! She made me as happy as I made her. Thanks Kary! 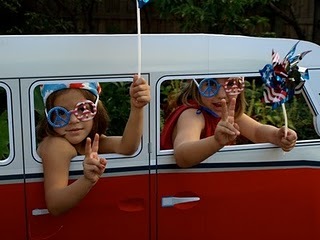 My daughter and I are headed to a May Day birthday party today - so exciting! So with May Day on the brain, I had to share this clever cake from none other than Ms. Stewart! It's an oldie, but a goodie! I found it in my Martha Stewart Living 2002 Annual Recipes cookbook.